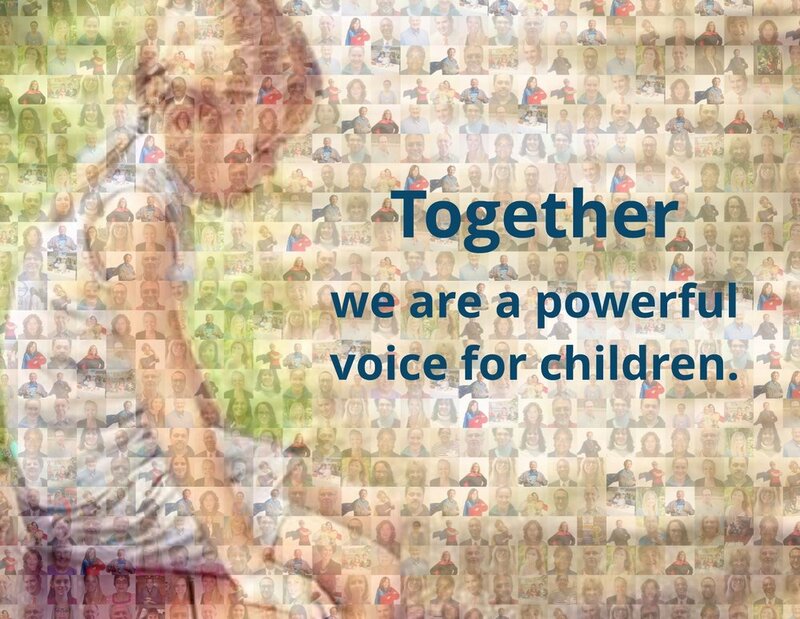 Battling child abuse and neglect takes a collective effort. The child above is composed of our 97 CASA Volunteers, 20 Board Members and 9 Staff, because TOGETHER we are a powerful voice for children. The holidays are a time to make happy memories with family. Unfortunately, there are hundreds of children in Lynchburg, Bedford County, Campbell County, Amherst County, and Nelson County who are not experiencing joy this holiday season. They are in the foster care system because of abuse or neglect. They're attending court hearings, adjusting to new foster homes and transitioning to new schools. That's a heavy burden for a child to carry alone. A court appointed special advocate (CASA) volunteer will be a caring, consistent adult for a child who's experiencing the loneliness and uncertainty of foster care this holiday season. With a dedicated volunteer, these children will have an adult by their side to speak up for their best interests in the courtroom and community, and to help them find the road home, wherever it lies. Our children's identities are confidential, so we are not allowed to show you the faces of the children we serve, but we can share their VOICE with you. We are part of a nationwide network of 87,000 trained volunteers who serve more than 280,000 children across the country who have experienced abuse or neglect. Throughout the year, 97 volunteers are showing the Lynchburg, Amherst, Bedford, Campbell, Nelson and NOW Appomattox communities' most vulnerable children that they are special and there is hope for a brighter future. But we're not done. With your support, more children can thrive. We at CASA of Central Virginia are determined to make sure every child in our community who has experienced abuse or neglect has the opportunity to thrive in a safe and loving home. Your generous support makes our work on behalf of these vulnerable children possible. Please consider making a gift to support our growth in 2018. If you have already given this year, thank you. If you haven't, would you consider an end-of-year gift at a level that is meaningful to you? By supporting CASA of Central Virginia, you will be providing constant support for kids who've been abused or neglected, just like a CASA Volunteer. Your gift means our community's most vulnerable children will have the powerful voices of CASA volunteers, safe homes, and promising futures. Please don't hesitate to make it, because "Together we are a powerful voice". Happy Holidays to you and your loved ones. I wish you peace and joy in the New Year.